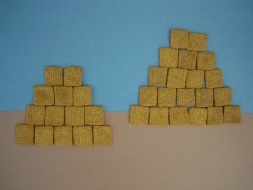 This Cereal Pyramids craft is an easy way for kids to learn about Egypt, not to mention they are really fun to make! 1. Prepare your paper: Cut a strip of brown paper and glue it to a piece of sky blue paper (you can also use double sided tape or those little mounting squares you use in scrapbooking). 2. Glue your cereal on the paper in a pyramid shape. It may be easier for younger children if an adult draws a pyramid shape on the paper first and they fill it in with cereal.